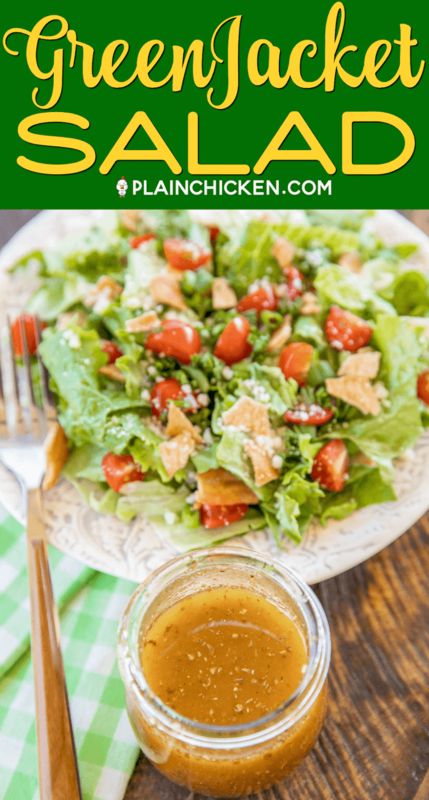 Green Jacket Salad - original recipe from the Green Jacket restaurant in Augusta. SO simple and it tastes great! Lettuce, tomatoes, parsley, green onions, pita chips, olive oil, red wine vinegar, seasoned salt, oregano, and parmesan cheese. Goes great with chicken, steak, soup, sandwiches, pizza - anything! Can make in advance and toss together when ready to serve. What is the Green Jacket Salad? 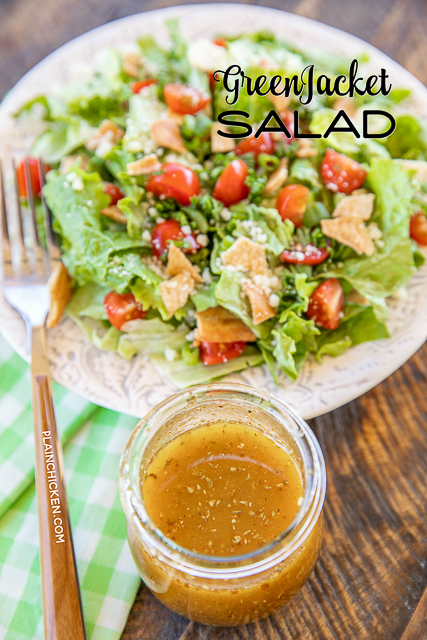 The recipe for this Green Jacket Salad comes from the famed Green Jacket restaurant in Augusta, GA. It was originally located directly across from Augusta National Golf Club. The restaurant is no longer in business, but I found the original salad recipe in one of my Masters cookbooks. It sounded good, so I whipped it up to go with dinner last week. The salad is SUPER simple. 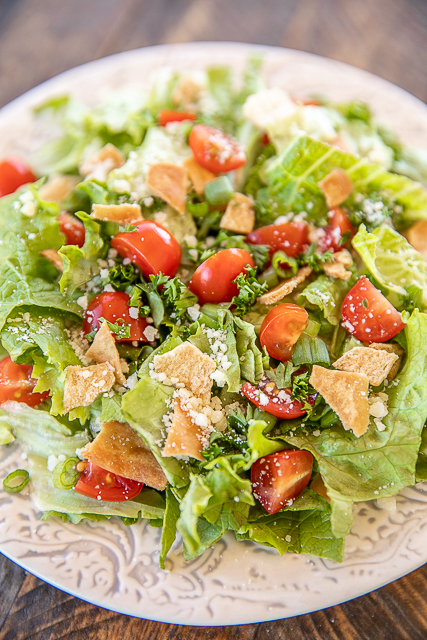 Romaine or Iceberg lettuce, tomatoes, pita chips, green onions, parsley, parmesan, and a quick vinaigrette. The original recipe says to toast pita bread pieces. I skipped that step and just bought a bag of pita chips. 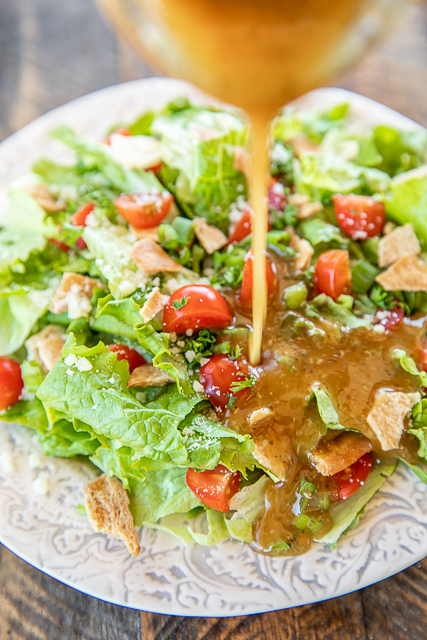 The dressing makes this Green Jacket Salad. Oil, red wine vinegar, fresh parsley, seasoned salt, oregano, and green onions. Don't skip the seasoned salt. 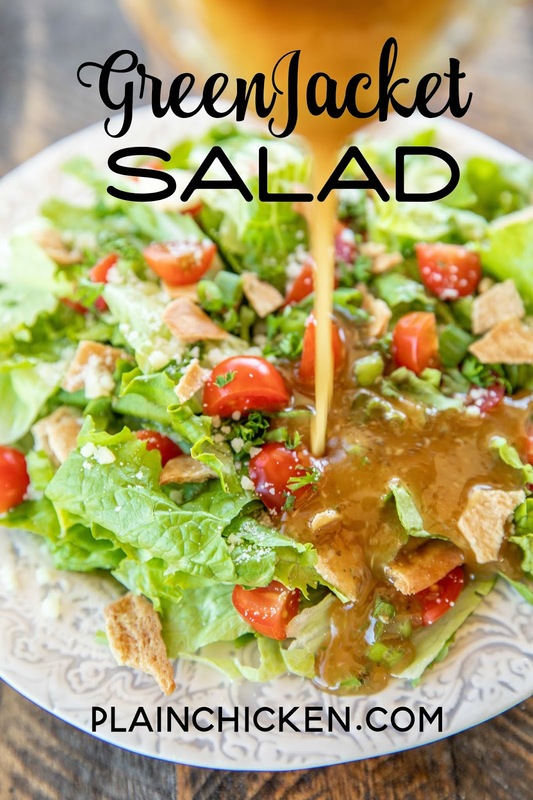 It really makes the dressing super delicious. You can chop the vegetables in advance and toss the salad right before serving. 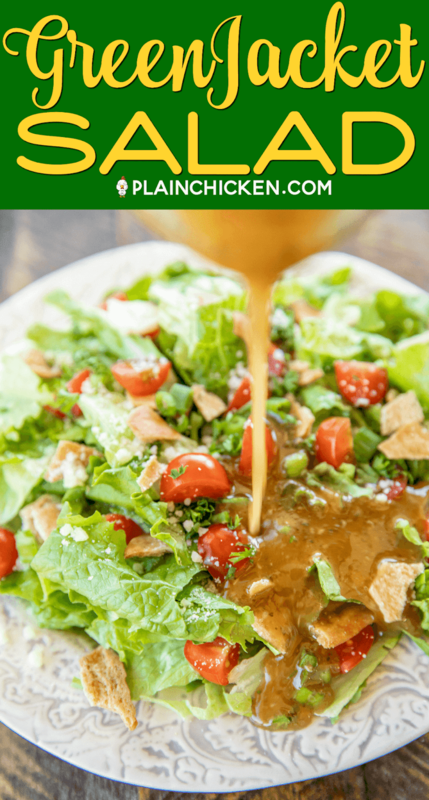 We like to serve this Green Jacket Salad with just about anything - pizza, steak, pasta, chicken, soup. It is great for lunch, brunch, dinner, and parties. You can easily double, triple or quadruple the recipe for a crowd. Give it a try for your next meal. I promise you'll love it! Whisk together oil, vinegar, parsley, seasoned salt, and oregano. 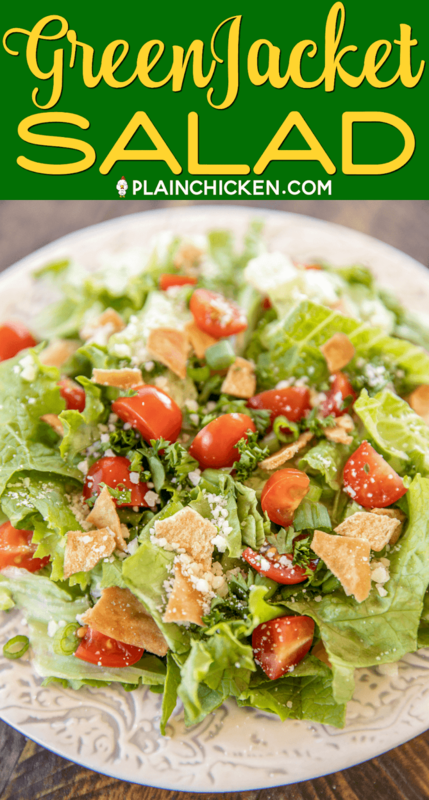 Combine lettuce, tomatoes, green onions, Parmesan cheese, and pita chips in a large bowl. Add dressing to the bowl and toss to mix. Can use either iceberg or romaine lettuce. so easy and so yummy - love the addition of pita chips!!! !